Warrior Princess tells the story of how Mindy became the first female Maasai warrior, undertaking physical and mental challenges far beyond her expectations. Removed from her real life of memory-foam mattresses and pinot noir, Mindy learns to drink blood, throw a spear, chop wood, and protect an entire tribe as part of her 'moran" (warrior) training. Despite some Chanel nail polish and lacy underwear, by the end of her training Mindy's killed her own meals, hauled water and trekked for hours without complaint. This is the story of a young woman - passionate, fearless and dangerously curious - who turned her back on the safety of her suburban life to face probable death in an effort to become the world's first female Maasai warrior. Defying the set-in belief that women aren't strong or brave enough to be warriors, Mindy goes on to prove that 'woman have a voice and a power to match". Today, Mindy has successfully become one of the first female Maasai warriors and an official member of the tribe. As a result of her training and advocacy, law in Africa will be changed in 2016 to allow all women the right to become Maasai warriors. Mindy Budgor is a 2012 graduate of the University of Chicago Booth School of Business. She started her first company while an undergraduate at the University of Wisconsin, and now lives and works in New York City. Mindy is now celebrating other women's stories by writing profiles of women she consider to be warriors in a myriad of arenas. Question: Why did you decide to write Warrior Princess? 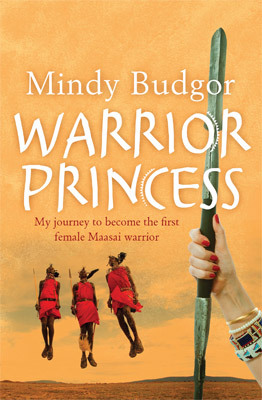 Mindy Budgor: I decided to write Warrior Princess after becoming a Maasai warrior. Whenever I would share a piece of my experience back at home in California, whoever I was talking with would respond that they felt inspired to do something related to their personal growth. This gave me the idea to capture my experience in print that would hopefully deliver a message that sparks passion in who'd ever read my book. As well, I wanted to express gratitude toward my tribe. Question: What originally inspired you to become a Maasai warrior? Mindy Budgor: I was 26 and already tired of working in an office. I had lost my inspiration, which I consider central to my happiness, so I decided to make a BIG change in my life. I traveled to Kenya to join a volunteer group building schools and hospitals in the Maasai Mara while waiting for my business school applications to go through. When I met a Maasai chief who told me that women weren't strong enough or brave enough to do men's work, I made a bet with him that he was wrong. He accepted my wager and agreed to take me though the rites of passage to become the first female warrior. But what really sealed the deal was when a Maasai woman named Faith approached me and said that generations of Maasai girls have dreamed of becoming warriors. If women had a chance to become warriors, maybe they would feel a little freedom and, for the first time, respect. Question: Can you tell us about the typical day of a Maasai warrior? Mindy Budgor: I can tell you that the typical day of a Maasai warrior does not involve Egyptian cotton pillows, cushy mattresses or down-filled comforters. We slept on beds of leaves with tattered wool blankets and Acacia trees for roofing. Our meals consisted of goat or cow meat (if we are lucky) or a soup made up of animal leftovers. Think goat head soup. We trekked for kilometers per day exploring the land, and we trained with our spears in order to build endurance and strength. No matter how far we strayed, however, we kept an ear to the community. In the event of a lion or elephant attack, we had to be able to respond quickly and protect our tribe. It's also the warrior's responsibility to entertain the community, thus we often travelled from celebration to celebration to sing and dance for hours at a time! Question: What do you hope readers take away from Warrior Princess? Mindy Budgor: I hope my readers will be more conscious, and appreciate and celebrate each and every moment. I want them to adopt and spread the message that 'just because something is different, doesn't make it wrong." I love the idea of broadening perspectives in a way that will lead to more respect for individuals everywhere. Question: What are you currently doing, now? Mindy Budgor: Well, after receiving my MBA from the University of Chicago, I moved to New York City. I'm currently working on a new book that explores the ways in which we might be able to spread warrior philosophy to the work-life balance. I'm also interviewing and writing profiles (Warrioress Profiles) on women who I consider to be warriors. When I came back from Kenya, I found that too often women didn't think they deserved to share or celebrate their journeys because their goals weren't completely accomplished. I realised that we are accustomed to celebrating successful achievements: acceptance into top ten schools, fitting into smaller dress sizes, sprinting across marathon finish lines. We're so obsessed with reporting the realisation of our goals that we lose sight of the success in the steps we take along the way: carrying out rigorous academic routines, adhering to austere diets and pushing our bodies to our limits. Our lists are endless, and so what we dream of remains forever in the distance. The Maasai, however, aren't interested in the management of expectations. In fact, they don't keep track of time. Instead, the only moment that matters is right now. In turn, progress is always being celebrated. The mindset isn't so much one of yes, I accomplished a goal, but one of there, a squarely planted step in my journey, which will continue like the journeys of those who march onward beside me. In other words, rather than raising champagne glasses only at the implausible ends we prescribe, they Maasai clink glasses with each step toward greatness. My hope is that the profiles I'm writing at Warrioress.org will help us start to appreciate our own journeys as well as celebrate those of others. Mindy Budgor: As a rule, I aim to continue lending and receiving inspiration. When I am inspired, I act with passion, and when I am passionate, I am my most positive and productive. If I ever lose my inspiration, I want to have the courage to make the changes necessary to bring me back to my center. In terms of my career, I aspire to build a global brand with a vibrant, entrepreneurial culture and that will have a positive social impact. Personally, I want to continue creating and fostering relationships with those whom I love.